Christina Kuriacose is a Program Associate at the Center for Collaborative Education. 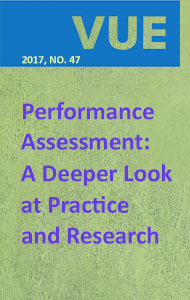 Four examples spanning grade levels and disciplines demonstrate the range and possibilities of performance assessment. These examples were compiled by Christina Kuriacose, Program Associate, Quality Performance Assessment, Center for Collaborative Education. The following performance assessments are strong examples of teacher-developed performance assessments from schools within the Center for Collaborative Education’s Quality Performance Assessment network. These performance tasks demonstrate the pedagogical decisions teachers made, as well as the ways the experience allowed for deeper learning. While these summaries do not address the full curriculum, expectations, or teaching context in which the tasks are embedded, they do offer a consistent format to explore task details and learn more about work resulting from teacher-created, student-centered design. Depth of Knowledge 1: Recall; memorization; simple understanding of a word or phrase. Depth of Knowledge 2: Covers level 1 plus: paraphrase; summarize; interpret; infer; classify; organize; compare; and determine fact from fiction. There is a correct answer, but may involve multiple concepts. Depth of Knowledge 3: Students must support their thinking by citing references from text or other sources. Students are asked to go beyond the text to analyze, generalize, or connect ideas. Requires deeper knowledge. Items may require abstract reasoning, inferences between and across readings, application of prior knowledge, or text support for an analytical judgment about a text. Depth of Knowledge 4: Requires higher-order thinking, including complex reasoning, planning, and developing of concepts. Usually applies to an extended task or project. Examples: evaluates several works by the same author; critiques an issue across time periods or researches topic/issue from different perspectives; longer investigations or research projects. See www.qualityperformanceassessment.org for additional information. Plymouth Elementary School, part of SAU 48 in New Hampshire, entered performance assessment work by focusing on assessment literacy. Over three years, the school’s professional development plan focused on building the full staff’s capacity to design, validate, and implement performance assessments. As part of their collaborative practice, Plymouth teachers engage in monthly validation sessions that are facilitated by a volunteer group of teachers. Incorporating feedback is a key focus as the faculty members build their assessment literacy. Plymouth Elementary School is also a Tier 2 (building capacity) member of New Hampshire’s Performance Assessment for Competency Education (PACE), a statewide initiative in which member districts and schools are exempt from most state standardized testing and use teacher-generated local and common performance assessments in its place to assess student learning. Beginning in the 2017-2018 school year, the school will become a Tier 1 PACE school; the PACE performance assessment system becomes their state accountability model. The Your Community task is designed to help students see the diversity of people, places, and things that are included in communities. After completing a unit on the community, students draw a picture of a community, real or imagined. They are asked to include and label people, buildings, animals, and nature. Once the maps are completed, students present their maps to the class, explaining how people use the different spaces in their communities, what makes their community inviting or uninviting to live in, and what people do in their community. Topic: What is a community? Bakie Elementary School is part of the Sanborn School District in New Hampshire. Sanborn is a vanguard district in New Hampshire in terms of competency-based education (competency-based education sets broad learning targets of what students should know and be able to do; students progress as they demonstrate proficiency over them), and was one of the initial districts in the founding cohort of NH PACE schools. Since 2012, Sanborn has been hosting a summer symposium on competency-based learning, inviting schools from all over the state and beyond to attend. Because their approach to competency-based learning is vertically aligned from kindergarten through 12th grade, the Sanborn School District frequently hosts site visits for schools exploring the shift towards competency-based learning. With this task, three teachers aim to integrate civics standards into their fourth grade lesson about government through a persuasive writing task. Pairs of students are asked to research an issue that is important to them. Based on the research, they individually write persuasive essays proposing a state bill. In their essays, they must consider arguments and counter-arguments. Finally, the students go back to their pairs to draft a final proposal, combining their ideas. These proposals are brought to a mock New Hampshire Senate session where the students proposing the bill act as co-sponsors and their peers as Senators. In this formal mock Senate session, the co-sponsors stand up and present their bill. If the bill is passed after a Senate vote, it goes on to the governor for veto or signing into law. This task introduces students to the law-making process, the balance of power in government, and the process of decision-making about civic issues that are important to them. Abraham Lincoln School is one of three Revere schools in the first cohort of Massachusetts Consortium for Innovative Education Assessment (MCIEA) schools, a partnership of Massachusetts public school districts and their local teacher unions to create fair and effective accountability systems through holistic measures for school quality and performance assessment development. During the second half of the 2016-2017 school year, a team of teachers attended four MCIEA Quality Performance Assessment Institute days in order to develop assessment literacy and experience the design-align-analyze cycle through creating an original task. The Lincoln team created and piloted four performance assessments in fourth grade math, second grade ELA, third grade science, and fifth grade social studies as a means of introducing the school to performance assessment. Performance assessment design is a key focus for the school’s Professional Learning Groups as the school builds out their assessment system. Also, assessment of and for student learning is one of three core foci for the Revere Public Schools’ 2016-2021 Improvement Plan. With the Designing Lincoln’s Playground task, three teachers integrate mathematical skills into a performance assessment that involves social skills and persuasive writing. Students create a blueprint of the playground for the Lincoln School, including various structures they would like to see in their park. They measure the recess yard in meters and create a 2D version with a partner in math class, measuring the area and perimeter in square meters and meters. Using their math skills, they draw a detailed square/rectangle of each playground structure on a poster. Each of these squares/rectangles symbolizes the play structure’s scale in real life. Then the students write a persuasive essay in ELA to convince an audience that their playground is the best design for the school. Students present their designs to the Lincoln School families and community. Selected designs are built as a 3D model collaboratively, to scale, in art classes. Regional School Unit 2 (RSU 2) serves the towns of Dresden, Farmingdale, Hallowell, Monmouth, and Richmond, and the Senior Capstone is the culmination of its proficiency-based, learner-led system. The Senior Capstone for Maine RSU 2 was developed at Hall-Dale High School (one of three high schools in the district) as part of the school’s early exploration of personalized and agency-building practices. The entire faculty participates as mentors. “Senior Capstone” is a course that seniors take, so that the time and coaching they need is available to them. The creation of the course – and the first two years of the program – was the work of teacher Linda Aronson, who later went on to write about the experience and philosophy of Senior Capstone in her book, Unleashed to Learn. The Senior Capstone at RSU2 is designed to support the senior student in pursuing a fascination and demonstrating it to faculty, students, and community. Students choose a topic (e.g., tiki carving, boat building, business creation). They research that topic in depth, write a research paper, deliver a 20-minute public talk/exhibition that is open to the public, and “enact” their topic in an authentic way (e.g., they carve a tiki, build a boat, start a business). Students begin in December and present throughout the end of their senior year. Every student has two mentors: a faculty member in the school and a community member who can coach the student in their area of expertise. As can be seen in this video featuring the Senior Capstone at Hall-Dale High School in Regional School Unit 2 in Maine, the energy and import attached to the annual celebration is powerful. Students learn in the eighth grade what will be expected of them in the 12th, and they prepare and are coached through their high school career. Topic: How do I learn?